The Cartier Ronde Louis Pink Gold and Brown Leather Watch W6800151 is essential for the woman who wants a casual luxury watch. Its round case and leather band reflect a traditional design while incorporating the quality features of the Cartier name brand. The case is 18K pink gold, which provides a subtle elegance. Set in the 18K pink gold crown is a sapphire cabochon, a traditional feature of Cartier design. The dial itself is silver grained, and the blue steel hour and minute hands are apple shaped: both elements of the simple yet intricate design. With Roman numerals for hour markers (1-12) and Arabic numerals as sub-hour markers (13-24), the watch is quite functional and readable. Many luxury watches cannot provide this kind of easy readability. To accentuate the traditional yet sophisticated design, the watch features a brown leather alligator embossed band. The 18K gold buckle is a traditional tang clasp, which completes the classic look. This watch may be too simple or too casual for some women. The watch does not feature a date window or a second hand, both of which are desirable additions. However, the classic design might be impeded by those excesses, and the basic time-telling function is absolutely clear and precise. The Ronde Louis Pink Gold Watch retails for $8,400. 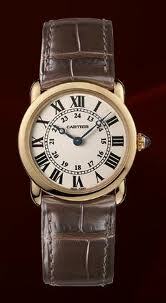 It is available online for significantly less, but you can also find the watch at Cartier.com and authorized Cartier retailers in your area. Cartier.com offers complimentary engraving for this model, which is something to keep in mind if you plan to buy this luxury watch as a gift. 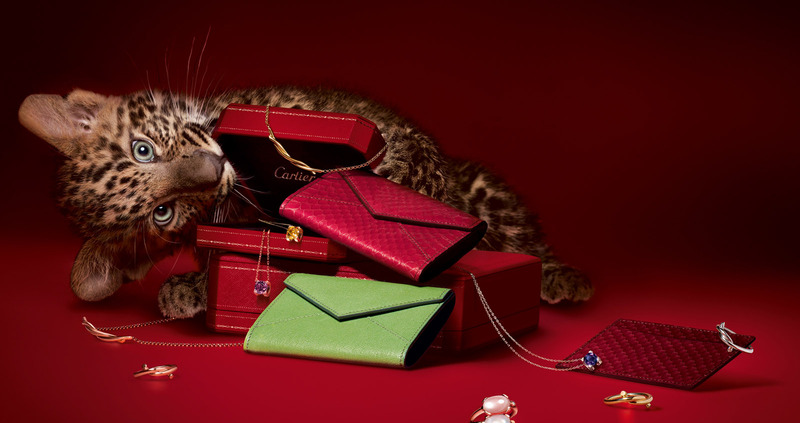 These versions are also available online, but the diamond-set versions would be best purchased at an authorized Cartier retailer. 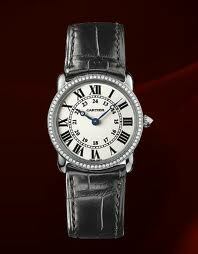 The Ronde Louis Small Watch is a gorgeous addition to any woman’s accessory collection. It is perfect for weekend wear or a slightly casual office environment. Really, though, its traditional design would be appropriate in a variety of situations, and in any case is a striking timepiece.